Opening reception August 6, 6 to 8pm. Renowned ceramic artist Kevin Crowe / Artists talk Aug 27, 6 to 8pm. The Foundry will host its first ever Juried Non-member Show, "Dupont Circle Scenes" of local artists that captures the beauty and energy of the Foundry Gallery's Dupont Circle neighborhood. Dwight Young from the National Trust for Historic Preservation will be the juror. Opening also "Community of Fire", an exhibit of wood fired pottery. Attendees are invited to enjoy the beautiful, one of a kind ceramic pottery and to peer into the life and processes of the potter's art. Also, in Gallery II is the Foundry's August display of members' art work. Open W - F, 1 to 7pm, Sat & Sun, 12 to 6. If you are in DC this week, it's the last week to see the Informed Design exhibition at Long View Gallery. Come see the architecturally designed spaces and the exciting fine art. I was invited to exhibit two large canvases that I'd love for you to see in person. Contact the gallery for information about the work. Two DC-based architects were given the same challenge: Create a space that illustrates the significant relationship between art, architecture and design. After only five weeks of preparation, architects Ernesto Santalla and David Jameson installed two unique architectural design vignettes at Long View Gallery for its current exhibition, “Informed Design.” The architects also chose artists to work with and then incorporated their pieces into the vignettes. Gallery Director, Drew Porterfield chose the work of artists Joan Konkel, Steve Griffin, Patricia Burns, Victoria Cowles, Susan Finsen, Anne Marchand and Wanda Wainsten to be featured in this exhibition. Give Me a Vote campaign will be present at the event: A Conversation with the Leading Candidates for Mayor and Council Chair on Thursday, July 29, 2010 The forum will take place at Auditorium, Building 46 of University of the District of Columbia on 4200 Connecticut Ave, NW from 6:30 PM - 8:00 PM. Come participate in this Conversation with the Leading Candidates for Mayor and Council Chair and meet the young artists who have been working with Give Me a Vote project. They will present their art on the sculptures they have fabricated this summer. Albus Cavus is working with a group of excellent young artists this summer. They are learning not only new artistic techniques but also about important issues in our city. Together, we have been fabricating and painting the hands. Go to the event at UDC tonight to meet them and see the latest sculptures. Irvine Contemporary presents Introductions6, the annual exhibition of new works by recent art college graduates. Join Gallery Neptune on July 31st when DRINK + DRAW, mixing cocktails and creativity for an evening of social adventure returns with "Exquisite Dog"! Their new spin on this surrealist drawing game will result in amazing art as the creative crowd has fun producing never seen before images of our favorite four legged best friends. The League of Reston Artists announces the Westin Hotel - Dulles as an ArtsCapade Partner The League of Reston Artists welcomes Westin Hotel-Dulles as a business partner for the 2010 ArtsCapade Outdoor Festival planned for October 23rd & 24th at Dulles Station in Herndon. The Second Annual ArtsCapade - an eclectic fine arts escape will feature juried artists from near and far in all mediums including photography, painting, sculpture, jewelry, fiber art, computer art and "the unusual". There will be interactive children's activities, live music, international foods and a wine and beer garden. Artist applications available at www.zapplication.org/festivals (search for ArtsCapade Dulles Station, Herndon, VA). The deadline is August 11th so apply now. The Westin will be hosting a Preview Party the evening of Friday, October 22nd. This event will feature artists participating in the festival and will be open to the patrons, partners and artists. Westin will provide space for the League of Reston Artists to hang artwork in their magnificent lobby and restaurant from September 23rd thru October 22nd leading up to the opening of ArtsCapade. Herndon is a diverse and above national norm community with the average home value of $445,556; and average incomes of $101,369 per household and highly educated with 51.8% attaining a bachelor's degree or higher. ArtsCapade and its business partners are committed to a public relations/media campaign to make this exciting event successful and fun for people of all ages. Celebrating its sixth year, this event boasts one of the most spectacular outdoor shopping environments in the region. This year the Downtown Holiday Market (DHM) will operate for 21 consecutive days. It will open Friday, December 3rd, and will run continuously through Thursday, December 23rd. Hours will be from Noon-8pm each day. Held in the vibrant Penn Quarter neighborhood with the Donald W. Reynolds Center for American Art and Portraiture as its backdrop, the festival will again be located on the wide sidewalk of F Street, stretching from 7th to 9th Streets NW. Both ends of the market are within view of entrances to the Gallery Place Metro. Also across the street are the Verizon Center and the bustling 7th Street Gallery Place corridor. Opposite the Market are Hotel Monaco, the Spy Museum, and many upscale restaurants. The event continues to be a juried, high-quality crafts and gift market featuring a diverse display from exhibitors of many types of merchandise, as well as prepared food and beverage vendors. The Market will accommodate 49 exhibitors each day. As it has done previously, the market will continue to rotate exhibitors through the event in segmented schedules, thus allowing for a rich variety of products and businesses to participate. New this year, the market will accommodate a select number of professional retail-oriented exhibitors to be set up for the entirety of the event, for an added fee. Creation of an exceptional booth design to enhance appeal as a “storefront” business will be required. All exhibitors wishing to participate must complete an application and pay a $40 application fee. A jury will review applications, images of products and booth display. The Downtown Holiday Market is produced by Diverse Markets Management and the Downtown DC Business Improvement District. Deadline: September 15, 2010. The Franz and Virginia Bader Fund invites visual artists (excluding filmmakers, video artists, and performance artists) to apply for grants to enable recipients to develop their talent and concentrate on their art. Artists must be 40 years or older, and must live within 150 miles of Washington, D.C. Four grants totaling $65,000 were awarded in 2009. Applications must be postmarked no later than September 15, 2010. Application forms are available for download from the Fund’s new Web site, www.baderfund.org, or by writing to the Fund at: 5505 Connecticut Avenue, NW #268, Washington, D.C. 20015. Send email inquiries to grantsatbaderfund.org. Please note that applicants may submit images of their work either on CD or in slide form. 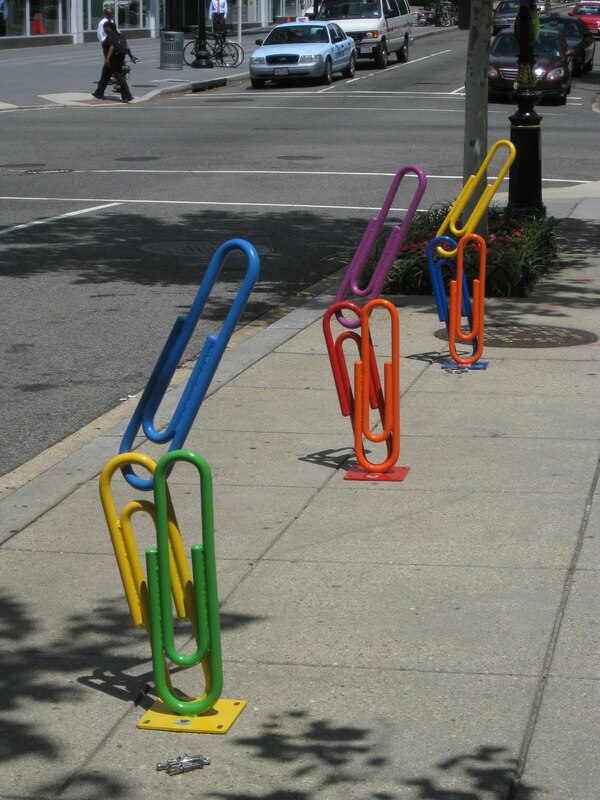 WASHINGTON, D.C., (July 23, 2010) – As part of its ongoing beautification program to bring public art and install more bike racks in the city, the Golden Triangle Business Improvement District (BID) unveiled a new artistic bike rack at the corner of 21st and L streets NW. 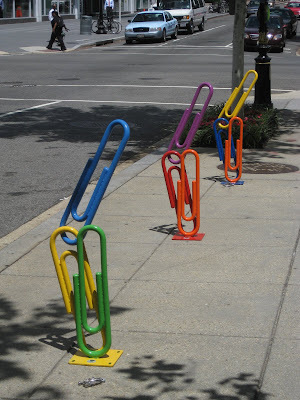 Named “Clip Art,” the new bike rack features three colorful structures formed in the shape of nine oversized paper clips, which can hold six locked bikes. The winning bike rack, designed by siblings, Kaylyn and Kyle Bancroft, was selected from 50 entries. Kaylyn is an incoming freshman at Boston University and Kyle is a junior at the University of Virginia.The Bancrofts received a $1,500 honorarium plus a complimentary Saturday night stay at The Hay-Adams. Since 2000, the Golden Triangle BID has installed 350 bike racks creating parking spaces for more than 700 bikes. Last year, an artistic bike rack, named “BIKE HERE,” that accommodates 10 bikes, was installed outside the Dupont Circle Metro station. The Golden Triangle BID has also transformed nine historic fire and police call boxes into works of art and commissioned two alley art projects. One mural is in the alley next to Luigi’s Italian Restaurant at 19th Street NW near M Street NW; and the second is next to the Farragut West Metro Station at Connecticut Avenue NW near I Street NW. The Golden Triangle BID has plans for a tree-lined median to be built along Connecticut Avenue NW from K to L streets NW. For additional information on the Golden Triangle BID, please visit www.goldentriangledc.com. The Golden Triangle BID is a private organization that works to enhance DC’s Central Business District from the White House to Dupont Circle and 16th Street, NW to 21st Street, NW. The BID’s primary focus is to provide a clean, safe and friendly environment within its 43 blocks of public space for area workers and visitors. The BID has a 23- member Board of Directors representing owners and tenants in the central business district. Its Ambassador program has 31 employees who focus on customer service. Morton Fine Art (MFA) has found a new location in DC. MFA’s innovative art lab will serve as part studio, part art consulting space and part gallery. As part of the unveiling, MFA will showcase an inaugural art exhibition, “Small Works on Paper.” The work featured in this exhibit includes watercolor, gouache pieces, wood engravings and mixed media paintings. Vonn Sumner – An LA based artist whose fanciful and eccentric characters invite the viewer into a parallel world. His work was honored with a solo museum exhibition, ‘The Other Side of Here’, at the Riverside Art Museum in California. Rosemary Feit Covey – A local preeminent wood engraver whose prints are held in permanent museum and library collections around the world. Featured work will include pieces from the ‘Strip’ series (including a unique artist’s proof) and the ‘Peep Show’ series. Laurel Hausler – A Washington, DC native who is inspired by her love for literature, antiquity and the absurd. Working in a subtractive process, she first covers the surface of her paper with multiple layers of paint, and then removes the layers to reveal the subject. An exciting new outdoor arts market brought to you by the Walter E. Washington Convention Center and the DC Commission on the Arts and Humanities (DCCAH). 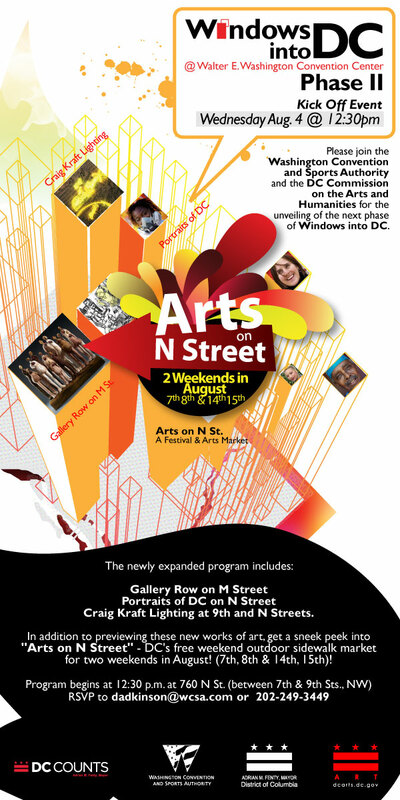 This August DCCAH and the Convention Center will also be partnering to host a two week Arts Festival along N Street between 7th and 9th Street. The Festival will feature art by local artists, music, fashion and businesses. The goal of the entire initiative is to provide spaces for artists and organizations to collaborate and learn from each other, while also offering District Citizens to free and public art. Arts On N festival, hosted by the DC Commission on Arts and Humanities (DCCAH) and the Washington E. Convention Center. The festival is free of charge and features art by local artists, music, fashion and local businesses. Arts On N will take place for two weekends in August, 7th –8th and 14th –15th from 10am to 4pm. This initiative provides free spaces for artists and organizations to showcase and sell their goods, while also offering District citizens free and public art. There's a new resource listed for public art murals referred through the NEA Arts Magazine. You can see a few of NEA staff’s favorite public art pieces in DC on their site and then go to the resource link and click on Mural Locator. It's a great resource for finding public art, www.murallocator.org. They've been online since January and growing rapidly. If you are a public artist, you can add a link to your mural. Check out my mural, Community in the Westminster Playground in Shaw, with a link on www.murallocator.org. home page. It was created in 2002 with funds from the DC Commission on the Arts and Humanities, DC Creates Public Art. I'll have some new murals up soon...one in Crystal City...so stay tuned! I founded City Arts DC in 1997 in order to continue the work I had begun under the auspices of DC Artworks, a nonprofit arts organization that supervised the District Mayor’s Summer Youth Program for the arts in conjunction with the Department of Employment Services. In 1996, DC Artworks closed its doors and City Arts was established to continue serving the District’s young people. MEET CANDIDATES FOR MAYOR - GIVE ME A VOTE! Give Me a Vote campaign will be present at the event: A Conversation with the Leading Candidates for Mayor and Council Chair on Thursday, July 29, 2010. The forum will take place at Auditorium, Building 46 of University of the District of Columbia on 4200 Connecticut Ave, NW from 6:30 PM - 8:00 PM. Come participate in this Conversation with the Leading Candidates for Mayor and Council Chair and meet the young artists who have been working with Give Me a Vote project. They will present their art on the sculptures they have fabricated this summer. Featured Artists: Vonn Sumner – An LA based artist whose fanciful and eccentric characters invite the viewer into a parallel world. His work was honored with a solo museum exhibition, ‘The Other Side of Here’, at the Riverside Art Museum in California. Founded as an innovative solution to the changing contemporary art market, Morton Fine Art (MFA) is a curatorial group that collaborates with art collectors, visual artists and business organizations to inspire fresh ways of acquiring and experiencing contemporary art. Committed to the belief that anyone can become an art collector, MFA incorporates a hybrid business model that combines collection advising, museum education and artist advocacy. For more information, visit www.mortonfineart.com. *a pop-up project is a curated art exhibition that bi-annually “pops-up” at various locations in Washington, DC. Each exhibition introduces a new group of emerging and mid-career contemporary artists to the Washington, DC area. For more information, visit www.apopupproject.com. A Road tattoo is in the works in DC by Steed Taylor. If you want to paint with the artist, show up this morning at Vermont Ave. and I streets NW. More volunteers are welcomed by the artist and Gallery Plan B. Very kool image and public art project! It's painting time! Bridging two cities with art and entertainment. 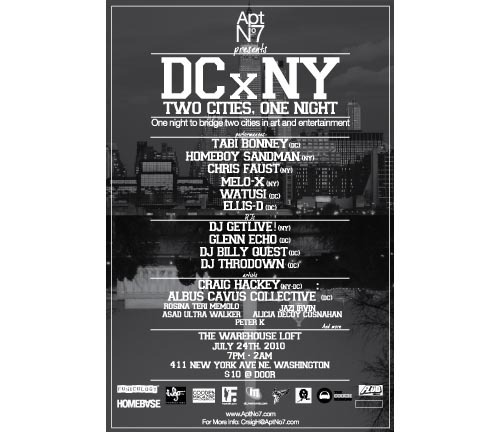 In The Warehouse Loft on 411 New York Ave NE, Washington DC on July 24th from 7pm to 2am. $10. Grab your hammer and nails and get ready for this year’s 1460 Wallmountables! A tradition since 1990, Wallmountables is DCAC’s annual open exhibit. We divide the gallery walls into 2’ by 2’ squares, you come and hang your work! Click here to learn more. FotoWeek DC and the Corcoran Gallery of Art and College of Art + Design invite you to celebrate a partnership made in photo heaven! SUMMER KICK-OFF PARTY to toast the two forces as we present FotoWeek DC 2010 from November 6-13. DJ Chris Nitti, photo projections, and learn about all that is to come for FWDC 2010. A sneak peek and free subscription to FotoPage, our new online photographer portfolio portal-a $49 value! Complimentary admission to the Corcoran's newest exhibition, Chuck Close Prints: Process and Collaboration. of your images during the party and complimentary prints to take home. $20 to benefit FotoWeek DC, a 501(c)(3) non profit. on the Arts and Humanities. Dr. Gridlock - Want to help tattoo a street? Steed Taylor to paint a road tattoo entitled “Daughters and Sons Knot”. Installation Begins Saturday July 24 through Sunday July 25 from 7AM - 7PM each day. As part of Mayor Adrian M. Fenty’s ongoing efforts to advance arts in the District of Columbia, the DC Commission on the Arts and Humanities (DCCAH) selected Steed Taylor to paint a road tattoo entitled “Daughters and Sons Knot”. Mr. Taylor’s design highlights Washington DC's relationship with war and loss by honoring metropolitan area soldiers recently killed while serving their country. The names of those soldiers’ children will be incorporated in the design. The design is a complex Celtic Knot with 6 loops, a symbolic number for harmony and alluding to the interdependence within a community as well as a family. The road tattoo is approximately 60 feet wide and 300 feet long and made with the help of local volunteers and neighbors. DCCAH NEEDS VOLUNTEERS TO HELP PAINT! Help make an incredibly meaningful public artwork for our city and be a part of DC history! For questions or more information e-mail Gallery Plan b, 202-234-2711, or Steed Taylor. Gallery plan b is coordinating the installation with Mr. Taylor. Images and additional information can be found on their website. Featuring new works by Reuben Breslar, Jennifer DePalma, Adam Dwight, and Treva Elwood, this year’s Exercises for Emerging Artists program, guest-curated by artist and professor Page Carr, highlights various incarnations of drawing, painting, and animation that explore themes of artistic process, personal history, character study, and the struggle for perfection. Launched in March 2004, Transformer’s Exercises For Emerging Artists was created to support artists at critical points or crossroads in their professional growth and development, and to advance participating artists’ creative careers. Consisting of a series of two-hour, bi-weekly gatherings spanning three months, the program is designed to stimulate and encourage participating artists as they create new work. In addition to peer critique sessions, the participating artists received mentorship and critical feedback on their work from artists Billy Colbert and Molly Springfield, as well as Andrea Pollan, Director of Curator’s Office. Addison/Ripley Fine Art presents "PORTRAY," an exhibition of the idea of portraiture by DC artists curated by Frank Hallam Day. The show explores the full compass of contemporary portraiture, with works ranging from painting and photography to video and sculpture. The exhibition examines the boundaries of what constitutes a portrait from the straightforward portrayal to the allusive and allegorical. Both well-known and emerging artists are featured in this exhibition. Addison/Ripley Fine Art thanks Reyes + Davis, Hemphill Fine Arts, Curator's Office, Project 4 Gallery, and the artists for their participation in this exhibition. ugust gallery hours, Tuesday-Friday 11-5 PM and by appointment. 1670 Wisconsin Avenue, NW . Washington, DC 20007 . 202.338.5180 . July 23-24, 8PM; tickets $10. In honor of the National Gallery of Art’s landmark exhibition, Beat Memories: The Photographs of Allen Ginsberg, literary hotspot Busboys and Poets hosts the two-night performance showcase, Howl in the City. Renowned poet Anne Waldman, a friend of Ginsberg’s and one of few females of beatnik bravado, will perform the epic poem accompanied by a string quartet. The series’ second night will feature a free patio performance by musician Kyp Malone of alternative rock band, TV on the Radio. "In May, at the ribbon-cutting for the new American Wing at the Metropolitan Museum of Art, the first lady crystallized the value of the arts by describing their impact in dollars and cents. She spoke of the nearly $160 billion that art and cultural activities contribute to the economy and announced the $50 million in stimulus funds earmarked for the NEA to preserve and create regional jobs in the creative industry. Her remarks, which positioned the arts as an engine of economic development, received a modest nod in the mainstream. But they sparked hoots of happiness in the creative community. " "Unlock Your Most Powerful Weapon: Your Speaking Voice"
Hear Marilou Donahue--a classical singer, a teacher of voice, and a former host of Artistically Speaking with Marilou Donahue on TV--on using your voice to unlock your personality and win over others. Learn to project your voice and set it free. Free admission. No reservations necessary. 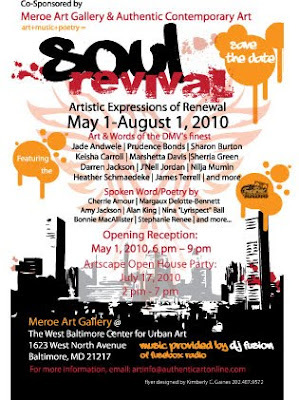 Emerging artists and poets based the DC/Baltimore Metropolitan area on the theme of "Soul Revival." We are speaking of revival of the soul, spirit, neighborhood, community, nation, and even the world. The result is a eclectic visual range of artistic expression, ranging from realism to abstract and everything in between! 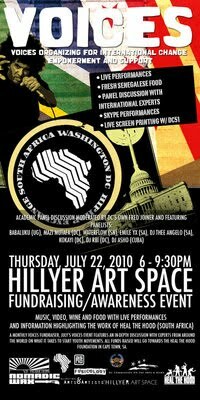 If you haven't heard, every month there is an engaging and exciting happening at Hillyer Art Space in DC. VOICES is a monthly event series designed to raise funds and awareness for grassroots organizations across the globe that support youth empowerment, development and leadership. If you haven't been to V.O.I.C.E.S, it's one of the most unique and progressive events in the city. The event is co-produced by Nomadic Wax, Asho Productions, and the Hillyer Art Space, with help and support from the DC Commission of the Arts. 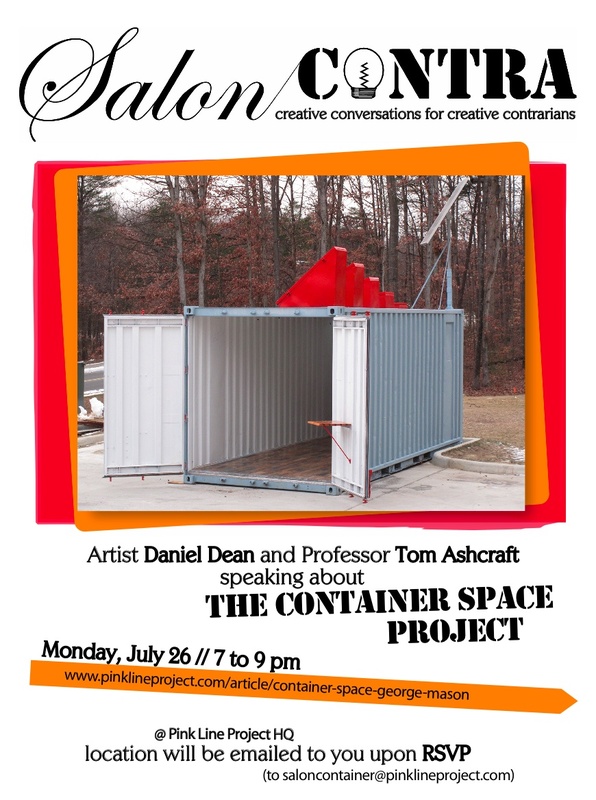 Project 4 invites design professionals in the Washington DC area, as well as patrons, contributors and friends to an Artist Talk at the gallery on Thursday, July 22nd from 6:30 - 8:30 pm. Artists Sharon Louden and Foon Sham will each discuss the artwork they currently have on display at the gallery, in ART+Space Exhibition. Linking the gallery's exhibition programming with our art consulting service, ART+Space Summer Exhibtition artists Sharon Louden, Jeanne Quinn, Foon Sham and Katy Stone will have installations on view that highlight their interaction with the space and showcase the versatility of each artists’ work to adapt to unique sites. WASHINGTON, DC – Flashpoint Gallery is pleased to announce painter Matthew Mann's first solo exhibition in Washington, DC. Adapted from Renaissance artist Giotto's Arena Chapel fresco cycle in Padua, Italy, Mann's The Cinecitta Chapel is comprised of six large-scale paintings. Created over the last year and a half, Mann's epic series replaces the religious iconography of Giotto's frescoes with cowboys and cartoon violence, creating pop culture allegories steeped in American myth. The scenes that make up The Cinecitta Chapel are each adapted from one of Giotto's Scrovegni Chapel frescoes depicting the apocryphal story of Joachim. Mann combines pictorial elements of the fresco cycle with visual inspiration from the Spaghetti Westerns of Sergio Leone and the cartoons of Chuck Jones. The paintings' skewed perspectives, familiar yet unfamiliar imagery and unresolved Technicolor dramas invite viewers to imagine their own stories based on the ambiguous narratives in the paintings. Playing with ideas of representation and narrative, and questioning the notion of "American-ness" is at the heart of the The Cinecitta Chapel. Employing humor and wit, Mann questions our myths and predicaments in a darkly comical and irreverent manner. On Wednesday, August 25, the gallery will partner with Pink Line Project to present Pink Panel @ Flashpoint, a panel discussion with artist Matthew Mann and Chief Creative Contrarian Philippa Hughes about the exhibition. “Thought DJs” Adam Good and Jon Lee’s WE ARE SCIENCE! will give a live performance in conjunction with the event. The event begins at 6pm and there is a $10 suggested donation. MAP’s annual exhibition of work by recent MFA graduates returns with a new name. Young Blood features installation, sculpture, video, painting, drawing, and performance by artists John Farrell, Christine Ferrera, Maggie Gourlay, Tim Horjus, Benjamin Kelley, Jeffrey Kent, Sarah Laing, Natalia Panfile and Ailsa Staub. Learn how to design and create a reusable stencil for printing on paper, fabric, or even walls. Enjoy the immediacy of painting with palette knives, or rather painting knives. Paint on canvas board with Charlotte Hagins guiding each participant in mixing and applying paint directly to a canvas as well as utilizing the painting knives to make a variety of marks. Check out the video from opening night at Long View Gallery. "Informed View" exhibiting artists include Joan Konkel, Anne Marchand, Tory Cowles, Steve Griffin, Patricia Burns, Wanda Wainsten and Susan Finsen wIth architectural installations by Ernesto M. Santalla and David Jameson featuring artwork by: Barbara Joseph Liotta, Ralph Turturro, Steve Cushner, Mary Early, James Huckenphaler and Jackie Hoysted. CM Dupre's new series Alice will be featured at the new Art League Gallery space in National Harbor, MD from July 20 - September 5, 2010. Opening reception: Tuesday, July 20, 6:30-8:30 pm. Who else has continued to lead such an eventful and fascinating existence as Alice? Compared to saints, heroes, screen stars, musicians and artists, intellectuals, inventors, politicians, she’s given us more: in elaborate chains of circumstance, indelible processes of redefinition, psychological growth and exorbitance. Her strengths arose from curiosity and imagination. There is no doubt that Alice IS—and more—she is transformation. So the titles tell part of her story. “Alice is the Variable ‘X’,” “Alice is a Leaping Metaphor,” “Alice is the Deus ex Machina,” “Alice Is and Alice Isn’t”: clues to Alice’s potential and her increasing influence (initiated by the spell-bound gaze of Lewis Carroll). Her potential is step-by-step, beginning in childhood calculations, punctuated rebuttals, word-games, chance meetings, and entry into several worlds at once. They award her perceptions while creating her as virtual abundance—a hybrid artwork in an interrogatory space. The second series takes Alice’s motivated forces further than self-identity and the Self as inscribed, as expression, as contour-context, or as a subject-summary. Alice’s role goes on from a reality-fantasy condition that can begin to remark on the world through her infinite varieties and shifting shapes—that give her fame and fortune—onto different terrains, times, places, including for instance, the year 2010 of inclusion. Her inner complexities become a sifting, sieving, filtering drama that stretches out beyond Alice in Wonderland, the proverbial Looking Glass, or Alice Liddell, flowing onto a world stage of reciprocal cycles and surrounds of meaning: the air that is breathed by others, cures found only in the unknown, in the shade of mourning and memory. Alice begins to search through living archives, finding in them an inconsolable poetics as she discovers varied replacements to the ‘unknowable sublime,’ presentable for now in the most compelling language of all, imagery. Location: The Art League at National Harbor is located at 120 American Way, Oxon Hill, MD 20745. Hours: Wednesday–Friday, noon–7:00pm; Saturday–Sunday, noon–6pm. 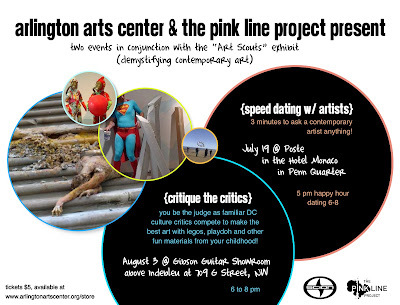 Pink Line Project, In conjunction with the "Art Scouts" exhibit at Arlington Arts Center, in an effort to demystify contemporary art, participants will have three minutes to the featured contemporary artists anything about their work/process. 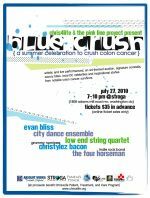 The Chris4Life Colon Cancer Foundation, in partnership with The Pink Line Project and Pamela's Punch , will host the 1st Annual “Blue Crush” Summer Celebration to Crush Colon Cancer on Tuesday, July 27, from 7-10PM at the new and exquisite Adams Morgan space called STROGA. The evening will be filled with artistic and live music performances, an opportunity to purchase limited-edition prints commissioned from DC’s top artists, signature cocktails, savory bites, a VIP reception, local DC celebrities and inspirational stories from notable colon cancer survivors. This world-class performance event will celebrate colon cancer patients, survivors, and caregivers. Read more about it at Pamela's Punch. the ten year anniversary of annual invitational survey of outstanding work by MFA/BFA students in the Washington/Baltimore area. Alan Sonnenman's painting is found and will be shown at WPA's Nov. 9 opening of “Catalyst,” the WPA’s anniversary show. Read "On the trail of Alan Sonnenman’s apocalyptic image of nuclear doom" in today's Washington City Paper. Good investigative work everyone! ARTSCAPE VISUAL ARTS EXHIBITON OPENINGS BEGIN TONIGHT! Tonight are the opening receptions for the Sondheim Semi-Finalist Exhibition; Here, There, Anywhere (Outdoor Sculpture Exhibition) & WHAM CITY: CROSSOVERS! Refreshments will be available on the first floor of the Fox Building of the Maryland Institute College of Art. Below are the details of the Artscape Onsite Exhibitions; all other shows listed will be opening with Artscape tomorrow at noon. This outdoor artwork exhibition features 26 artists and artist groups whose contribution to the show will utilize a traditional white pedestal measuring 40” high X 24” X 24” to display their works in sometimes untraditional ways. The artist will also digitally transfer images of their small scale works onto a location of their choice and in the scale of their choice. The digital images of the work re-sited will be on view at multiple locations at Artscape and online. Artists: Luke Allen, Rochester, NY; Lindsey Bailey, Baltimore, MD; Jennifer Becker, Baltimore, MD; Anthony Cervino, Carlisle, PA; Alexander D’Agostino, Baltimore, MD; Jim Doran, Reisterstown, MD; Michael Farley, Baltimore, MD; Jamie Freedman, Baltimore, MD; David Friedheim & Trisha Kyner, Baltimore, MD; Jim Hillmann, Baltimore, MD; Steven Hoffman-Shapiro, Pikesville, MD; Karen Lemmert, Baltimore, MD; Patrick McDonough, Washington, DC; Robert Moon, Baltimore, MD; Samantha Pasapane, Baltimore, MD; Jeremy Rountree, Baltimore, MD; Richard Roussell, Ellicott City, MD; Gabriel Snyder, Baltimore, MD; Ailsa Staub, Baltimore, MD; Laura Shults Stella, Baltimore, MD; Trish Tillman, Brooklyn, NY; Jacob Ulrich, Baltimore, MD; Marty Weishaar, Baltimore, MD; Carl Wright, Martinsburg, WV and Andrew Yff, Parkville, MD. Now in its fifth year, the Janet & Walter Sondheim Artscape Prize awards a $25,000 fellowship to an artist working in the Baltimore region. The fellowship is designed to help support the artist to develop new work. The seven finalists for this award will have work installed in The Baltimore Museum of Art with the fellowship winner being announced on Saturday, July 10. Artists: Leah Cooper, Baltimore, MD; Ryan Hackett, Kensington, MD; Matthew Janson, Baltimore, MD; Nate Larson, Baltimore, MD; Christopher LaVoie, Baltimore, MD; Matthew Porterfield, Baltimore, MD and Karen Yasinsky, Baltimore, MD. Thirty seven semi-finalists were selected in the first round of the Sondheim Prize. This exhibition expands on the finalist exhibition at The Baltimore Museum of Art by showing the broad range of artists whose work was reviewed in depth in the second round of the Sondheim review. Artists: Alzaruba, Baltimore, MD; Christine Bailey, Baltimore, MD; Kelley Bell, Baltimore, MD; Travis Childers, Fairfax, VA; Brent Crothers, Bel Air, MD; Oletha DeVane, Ellicott City, MD; Annie Farrar, Baltimore, MD; Shaun Flynn, Baltimore, MD; Dawn Gavin, Baltimore, MD; Breon Gilleran, Baltimore, MD; Amy Glengary Yang, Washington, DC; Michelle Hagewood, Baltimore, MD; Evan La Londe, Baltimore, MD; Lawrence Lee, Baltimore, MD; Kim Manfredi, Baltimore, MD; Ben Marcin, Baltimore, MD; Christina Martinelli, Baltimore, MD; Sebastian Martorana, Baltimore, MD; Alexa Meade, Chevy Chase, MD; Maggie Michael, Washington, DC; Ledelle Moe, Baltimore, MD; Cory Oberndorfer, Washington, DC; Siobhan Rigg, Washington, DC; Michael Sylvan Robinson, Baltimore, MD; Rachel Rotenberg, Baltimore, MD; Adam T. Rush, Baltimore, MD; Christopher Saah, Washington, DC; Hadieh Shafie, Baltimore, MD; Dan Steinhilber, Washington, DC and Melissa Webb, Baltimore, MD. The art cars return to Artscape once again with a mix of new cars and old favorites. Artists: Chris Hubbard, Karl Schlatter, Tim McNally, Greg Phelps, CM and Grace Laster, Andy Chivinski, Queen Becky, Clarke Bedford, Dan Van Allen, Theresa Adams, Holly Klemm, Bob Heronimous, Jeffrey Polanowski, Baltimore Rock Opera Society, Katherine Smith, Daniel Stuelpnagel, Andy Chivinski, Conrad Bladey, Margaret Bladey, Bonnie Blue and many more. Comic Strip is an exhibition of comics, illustrations, graphic novels or works which follow the basic format presentation of comic strips. Submitted work will be installed on the 60 foot long glass wall at the west entrance of Penn Station. Make and Display Your Own Comic Strip! A tent located on-site will be stocked with drawing materials which will allow the public to participate and create their own comic strips which will be added to the exhibit wall. Parking Garage Across from the Charles Theatre, located 1714 North Charles St. The Charles Street Garage is now in its third year as an element of the expansion of the Artscape festival onto Charles Street. For the 2010 Artscape exhibition in the Charles Street Garage, entitled, "A Full Service Garage: Contatenation (Disambiguation)" visual and performance artists co-habitate with social activists and community groups/organizations to engage a specific uninhabitable arena with a blurring of art and activism, focusing on the intersections and networks of the urban experience and landscape. Artists: baltimoreDIY (Aliza Sollins), Vincent Carney, Beau Finley, Sarah Doherty, Gary Kachadourian, URBANtells (Steve Bradley), Carey Chiaia, Ingrid Burington, Baltimore Song Mural Project: Project of the University of Baltimore, MICA, and the Central Baltimore Higher Education Collaborative, The Loading Dock, PEACOCK (Chris Attenborough and Sean Naftel), Jaimes Mayhew, Lauren Lloyd, Withhart, Nana Projects (Molly Ross), The Baltimore Free Store, Jenny Janis, Eric Leshinsky and Dustin Carlson. With car parts and car seats donated by Crazy Ray’s, artists will create one of a kind seating and lighting that will set the mood for the lounge which will be open to the public during the entire festival weekend. The works of functional art for the Art Car Lounge will be set-up at the intersection of Charles and Lanvale, the center of the art car exhibit. Broydelic Sidecar I and Stewart Mostofsky form a conceptual supergroup and will create a live soundtrack for the 1975 cult film classic, Death Race 2000. Directed by Paul Bartel. Now in its third year, the Midway returns with installations, performances, sculpture, live radio broadcasting and other forms of art and performance to create an alternate carnival midway. Peter Goode, artist and curator. Peter Quinn is a multi-disciplinary artist working internationally in both commercial and experimental output. He is the principal and founder of Projector7, a creative shop located in Baltimore and co-founder of the publishing collective called Creative Capitalism. Stewart Watson, artist and founder of Area 405 in Station North Arts District. Artists: Laura Stella, Andy Stella, Stephanie Halpert, Alisa Alig, Julia Stone, Sarah Konigsburg, Spoon Popkin, Scott Pennington, Nikholis Planck, Jeremy Crawford, Jacob W. Dillow, Amber Moyles, Zack Genin, Neil Sanzgiri, Graham Wimbrow, Connon Kizer, Ryan Murray, Kelly Schmal, Clarke Agre, C. Christopher Rouse, Intentional Noise Media (Andrew Stone, Ben Johnson and Mike Johnson), Jane Vincent, Michael Benevento, Andrew Liang, Sarah Matson, Jordan Bernier, Elie Sollins and Steve Santillan. Interspersed amongst the Midway activity and artist installations will be an exhibition of classic-style and contemporary sideshow banners. Illustration, collage and painting are among the mediums used to create this collection of banners. Curator: Nick Karvounis, an artist and faculty at Maryland Institute College of Art (MICA) and Resident Master Printer at Dolphin Press and Print at MICA and resident artist/administrator at Gallery Four. Artists: Erin Wallace, Brian Butler, Jim Doran, Donald Ely, Alex Fine, Beppi Isbert, Bed&Breakfast (Colin Benjamin and John Bylander), Emily C-D, Jorge Catoni, Alexander Shaw, Jon Walters. Moving Pictures is a new interactive video project which will allow contributing filmmakers to shoot short films with festival attendees. The project will feature a semi-private film “studio” where filmmakers will shoot and screen their own unique shorts. With Visit Baltimore’s slogan “Find Your Happy Place” as the theme of this year’s city promotion as a point of entry, filmmakers will be asked to creatively incorporate the concept of joy or happiness into their short films. Also included as part of the Moving Pictures project will be a viewing area where films shot during the course of the weekend will be screened. The screening area will be comprised of more than 50 donated television sets which will screen individual and multiple films simultaneously. Moving Pictures is designed and operated by multi-media installation artists, Chris Attenborough and Sean Naftel of PEACOCK, an international arts collaborative. Sean Naftel is the director of 'The Roving Project' and Chris Attenborough is a museum assistant at the Contemporary Museum in Baltimore. Contributors: Drury Bynum, Kristen Anchor, Zach Morehouse, Rob Hatch and many more. The Baltimore art collective, Wham City, will be having their first official group exhibition which will be anchored in appropriation, interpretation, homage and parody in contemporary art and society. This theme will be expressed in the work of Wham City members who will appropriate the working styles of other group members and explore the personal connection artists in a small collective have to one another’s work. Artists: Dan Deacon, Jimmy Joe Roche, Allen Cordell, Jared Paolini, Sarah Milinski, Dina Kelberman, Erink Gleeson, Benjamin O’Brien, Stefani Levin, April Camlin, Robby Rackleff, Alan Resnick, Joshua Kelberman, Adam Endres, Mason Ross, Justin Durel, Lesser Gonzales and Liz Donadio. New work by six Baltimore artists that explores the boundary between painting and drawing. Artists: Andrea Collins, Alex Ebstein, Erin Fitzpatrick, Greg Minah, Thom Sawyer and Nicole Shiflet. Twelve artists reveal through photography the summer experience of heyday and youthful abandon. The collection of images exposes the excited energy innate to this season and the grittiness that accentuates it. Artists: Alyssa Robb, Monique Crabb, Jordan Bernier, Andrew Laumann, Katie Rose, Beth Hoekel, Lesser Gonzalez, Jen Mitzgata, William Cashion, Elena Johnston, Natasha Tylea, Dan Franz and Abe Sanders. Fri, July 16th 2010, 5 to 8 p.m. Celebrate Georgetown's art community with an array of artists and artisans at Georgetown's Monthly Art Walk! The Georgetown Gallery Gaze will be taking place every 3rd Friday of the month. Participating gallery owners will be opening their doors with extended hours, from 5 to 8 p.m., welcoming people with art, music, libations, and nibbles. Fine art, wearable art to adorn, and artful patrons will be there. All are invited to explore the festivities along the cobble-stoned streets of Georgetown, enjoying, appreciating, and socializing with the different local and visiting artists that each gallery spotlights. artdc Gallery presents a group exhibition of works that explore coverage with relationship to the body, geog raphy, and memory. Accumulating gestures and layers, while referencing the passage of time, these artists present works of sculpture, painting, printmaking and drawing. Sabeth Jackson’s work chronicles domestic themes and uses archetypal and culturally charged imagery to communicate emotions and stories. Megan Mueller finds inspiration in the architecture of tents and the lifestyles of the transient to investigate the idea of permission. Samuel Scharf explores the physicality of movement, collection and deconstruction. E7: Tetrad's second opening reception featuring new painting, drawing, and animation by Exercises artists Adam Dwight and Treva Elwood. 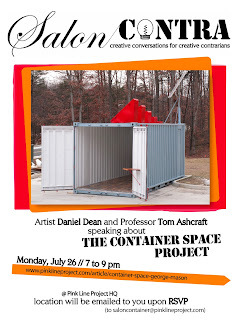 An artist talk will take place the following day, Saturday, July 24 at 2pm. The story of the Hiroshima Children's Drawings is one of a long, terrible war ending and, in its aftermath, two small groups building a new world through a gesture of reconciliation. A docent from All Souls Unitarian Church in Washington, DC, will present some of the drawings and speak about their legacy. Steve Lapham and Andy Zatman will be the musicians. 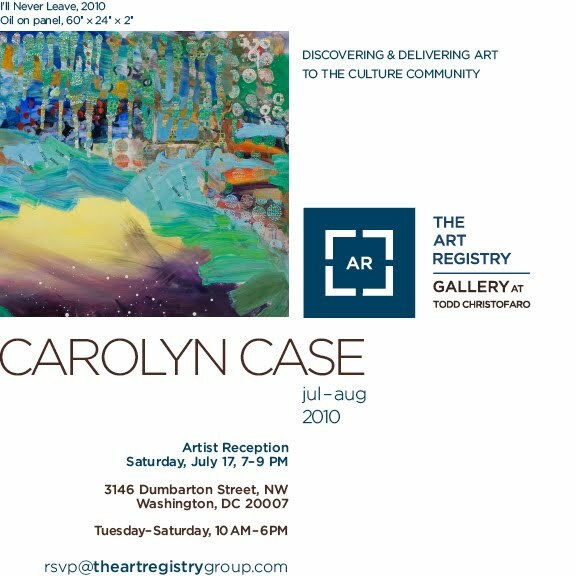 Sunday, August 8, 2010 at 10:00 a.m.
Art House Open House gives real estate hounds and art lovers the opportunity to preview DC's hottest real estate while viewing the work of local artists. See what an eclectic mix of art from traditional oil portraiture to street art looks like when installed collectively in a home. The show will feature the work of local artists including Tim Conlon, Ellen Cornett, Rod Glover, Martha Huizenga, Katherine Mann, Anne Oman and Sarah Thibodeaux. In addition, Studio H is proud to present the work of Dino Almaguer who produces one of a kind furniture from recycled and environmentally responsible materials. 610 Independence Avenue SE is a home that has been stripped to the studs and completely renovated inside and out with the highest end finishes. The three bedroom, three and a half bathroom home features living spaces on three finished levels, a two story deck and a beautiful flagstone patio. The Master bedroom suite includes a massive walk-in closet, sit-in shower and overlooks beautiful Brown's court, one of Capitol Hill's treasured alleys. As a companion visual to the exhibition Chuck Close - Prints: Process and Collaboration, currently on display at the Corcoran Gallery of Art in Washington, DC, Adamson Gallery will have on view several prints by Close printed and published by Adamson Editions. Other Adamson Editions publications by Lyle Ashton Harris, Kim Keever and Robert Longo will also be on display in the gallery through August. To see more, please visit adamsongallery.com. MPAartfest juror, Trudi Van Dyke, has selected forty-four artists to participate in the fourth annual MPAartfest on Sunday, October 3, 10:30 am - 4:30 pm in McLean Central Park. Ms. Van Dyke, an Independent curator and fine arts consultant said "As always, the MPA is a magnet for all good things art and the applications submitted to MPArtfest were no exception. It was both an outstanding opportunity and awesome responsibility to select from a broad pool of artists. I am looking forward to joining the community in attending this great festival." Of the selected artists, twelve are from the McLean/Great Falls area and sixteen are new to MPAartfest. MPAartfest transforms McLean Central Park into a lively art gallery featuring the sale of the fine arts and crafts of 44 artists. MPAartfest includes fun activities for both children and adults, as well as live music and refreshments. There is no charge to attend MPAartfest, although a donation of $5 is greatly appreciated which helps support McLean Project for the Arts and this special community event. For more information about McLean Project for the Arts and MPAartfest, please visit www.mpaart.org or call 703-790-1953. The Top 25 Arts Destinations. Washingon, DC made #3 in Big Cities! July’s 3rd Thursday: VSA Washington D.C. will be hosting a yard sale in their outdoor courtyard, on the corner of 16th and L Streets. Stop by after work and take advantage of this half-price sale on original artwork created by our ARTiculate ARTist Apprentices. The youth who participate in the ARTiculate Employment Training Program are young adults from the local area with special needs. VSA Washington D.C. provides artistic, vocational, and job readiness training through the arts. A few pictures from Longview Gallery's "Informed Design" opening last week. I have two works in the exhibition. Stop by this summer to see the exhibition. Here are the 100 DC area artists whose work will be highlighted, discussed and illustrated in the forthcoming book (tentative title) 100 Washington Artists. Juried by artist, musician and composer Paul K. Miller aka DJ SPOOKY, EMS 2011 will showcase the new media work of exceptional and under-recognized talent. Currently on display in Studio B | Delicacies - a delectable exhibition of fine art. May 22 - July 11, 2010. This will be the last weekend for the exhibit. In the spirit of the 4th of July and Bastille Day, it's a face-off between the best French made chocolates and the best American made chocolates. You will decide the winners with your vote! Joining Biagio will be good friends from de Vinos Wine, sampling a French wine and an American wine. Also being sampled, Chocolate Stout and Hazelnut Brown Nectar from Rogue Beers of Oregon. What is Sample Day? It is a new "tradition" that has been wildly successful with customers. Biagio will have over a dozen varieties of some of the world's best chocolate available for tasting throughout the afternoon. Sample day is held in Studio B, the tasting room/gallery behind Biagio Fine Chocolate. Eleven artists have been selected as finalists for the eighth annual Trawick Prize: Bethesda Contemporary Art Awards, a juried art competition and exhibition produced by the Bethesda Arts & Entertainment District. 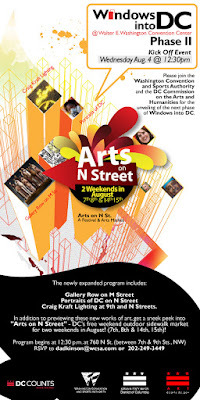 The work of the finalists will be on display from September 1 – 25, 2010 at an art gallery in downtown Bethesda at 4728 Hampden Lane. The prize winners will be announced on Wednesday, September 1st at a special press event at the Gallery. The Best in Show winner will be awarded $10,000; second place will be honored with $2,000 and third place will be awarded $1,000. A “Young Artist” whose birth date is after April 9, 1980 will also be awarded $1,000. Centering on contemporary figurative painting, the works in this exhibition reflect myriad styles and approaches, with all highlighting 8 artists' embrace of the subtle and singular set of processes involved in painting people. STAMP Print copies are here! Daily Campello Art News I've had it. AAC DEADLINE FOR 2011 SOLOS SUBMISSIONS EXTENDED!